The Beautyrest Five-Zone Mattress Protector has the unique five-zone stitch pattern that provides extra comfort and support where the body needs it most. The five-zone Protector has a depth of 16 inches and molds securely to deep pillow-topped mattresses. This durable, yet comfortable pad boasts a 500 thread count cotton top cloth with a plush polyester fiber fill that provides better shape and support than traditional pads. This pad is made in USA of high-quality hypoallergenic materials and is specially treated with stain-release protection for easy care. The Beautyrest Five-Zone Mattress Protector - Twin Size has many exciting features for users of all types. 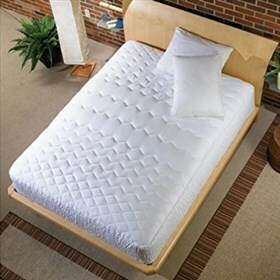 The Beautyrest Five-Zone Mattress Protector - Twin Size is sold as a Brand New Unopened Item.